Jack asked for a red and white stripey top hat. I am doggedly knitting my way through 100 80st rounds of chunky yarn on 4mm needles. It is actually going quite quickly - this is 62 rounds I completed yesterday afternoon. 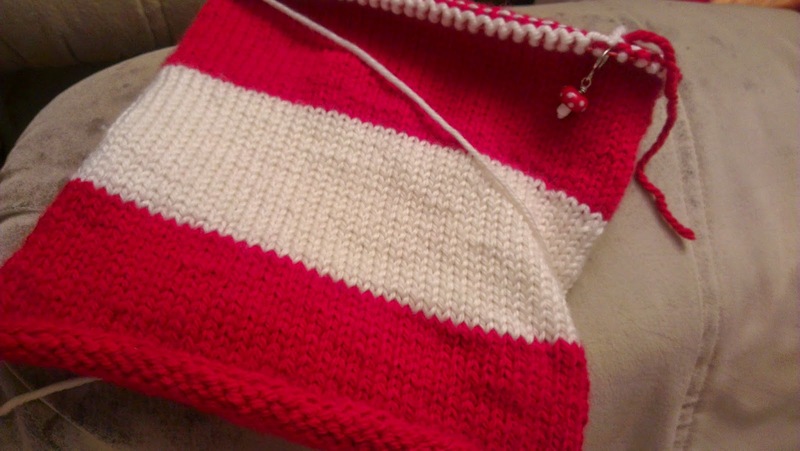 I only have 28g of the red left so the final red stripe will not make it to 20 rounds + top, I fear - but it's going to be taller than the original anyway I think, because I'm knitting with chunky on 4mm needles instead of worsted on 3.25mm.